This op-ed was written by Cosima Cloquet. The opinions expressed in this op-ed belong to the author and do not reflect the opinions of the European Interagency Security Forum (EISF) or any employee thereof. The long-standing humanitarian crisis in the Democratic Republic of Congo (DRC) has worsened in recent years. At present, it is estimated that over 5 million people have been displaced and more than 13 million are in need of humanitarian assistance. This op-ed will consider the security and access challenges faced by humanitarian actors trying to respond to needs in the country in light of insecurity, poor governance, and the upcoming elections. Affecting primarily the south-eastern provinces of DRC, the crisis is the result of decades of instability. However, the recent increase in violence and the current humanitarian crisis has political roots. Since President Kabila’s refusal to relinquish power in 2016, clashes between rebel groups and government-sponsored militias have intensified, affecting civilians as both groups’ attempt to control land and livestock. Alongside this political tension, inter-ethnic violence erupted in the Tanganyika and South Kivu provinces in mid-2016, causing the displacement of 1.3 million people. The complexity of this crisis is further increased by widespread food shortages and recent outbreaks of Cholera and Ebola. However, the country is far from receiving the international support it requires. In 2017, the DRC received less than half of the $812 million in funding humanitarian agencies had deemed necessary, ranking it as the second lowest funded major world crisis. Steadily rising levels of violence in the last decade pose an increased risk to international and local staff engaged in humanitarian work. In August 2017, U.N. agencies and humanitarian groups highlighted the deteriorating security environment in the DRC, stating that 75 aid workers had been attacked since the beginning of 2017. Since then, in December 2017, 15 UN peacekeepers were killed in North Kivu state and in February, two local aid workers were killed and a third kidnapped. The Kivu Security Tracker shows that the number of aid worker and civilian kidnappings is also rising with 1246 abductions and 543 kidnappings in the Kivu region alone since April 2017. While the death of two UN investigators raised an international outcry in 2017, local staff are the most vulnerable in the deteriorating security environment. In 2015, 259 of the 287 staff attacked in the DRC were locals, highlighting the common reality that local NGO staff are exposed to greater risk than their international colleagues. Humanitarian experts fear that the Congolese government’s attempts to tarnish the reputation of aid agencies and other such bad publicity affect local staff before any others. Since 2015, Frontline Defenders has noted that Kinshasa has passed restrictive legislation in order to control and disrupt the work of human rights activists. The government notably launched an administrative inquiry against a network of 33 national NGOs advocating for human rights, the Coalition Pour le Respect de la Constitution, claiming that many of them were not legally registered. In a statement given in March 2018, the Congolese government accused the majority of national NGOs of operating illegally, suggesting renewed animosity. Shortcomings of governance are a significant factor behind the current situation in the DRC, with implications for humanitarian access and security. According to Transparency International’s 2017 Corruption Perceptions Index, the DRC ranked 161st out of 180 countries with the highest perceived level of corruption. Linked to the prevalence of corruption in the DRC is a lack of investment in key infrastructure. The majority of the population living outside the DRC’s main urban centres does not have access to reliable transport routes, vital services, commodities and economic opportunities. Roads, bridges and waterways are either non-existent or in a critical state of disrepair, while air travel is limited, making humanitarian intervention both logistically complex and expensive. The absence of robust infrastructure continues to pose an acute challenge to NGOs as they respond to the recent Cholera epidemic and the resurgence of Ebola. Until recently security was not perceived as a key issue for NGOs in the DRC, however, the proliferation of violence by soldiers and armed non-state actors has compounded the challenges they face. Researchers note that the Congolese government’s lack of effective control over its security forces has created an environment in which tens of thousands of unpaid soldiers have turned against civilian populations for financial gain. As a result, aid delivered to populations is regularly seized and consumed or sold on by troops. Furthermore, dissatisfaction with the government and rising ethnic tensions have been major drivers for local insurgencies and outbursts of violence, particularly in states in the east of the country. Whilst humanitarian workers are rarely direct targets of violence, local staff are often caught up in incidents. While a presidential election was scheduled to take place in 2016, two postponements have pushed this back until December 2018. President Kabila has explained that this is due to instability and the challenges posed by registering millions of voters, but his political opponents claim he is buying time to remove the term limits and legalise his re-election. As Kabila clings to power and seeks to repress political protests, tensions rise across the country and clashes have been reported between soldiers, militias and various ethnic groups. 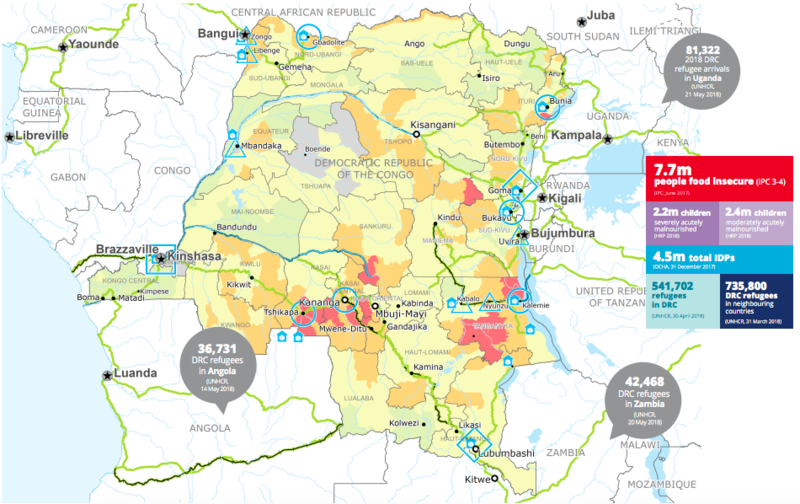 Despite the historic difficulty of gaining access to the DRC, a peak in violence in 2017 prompted a number of NGOs to initiate an emergency intervention plan in the Kasai. Tensions are also mounting between Kabila’s government and the international community. Kabila’s apparent unwillingness to step down and his government’s record of malpractice make donors reluctant to allocate more aid to the DRC. Furthermore, despite citing instability and voter registration as the rationale for pushing back the election, Kabila has denounced the Western media’s negative narrative surrounding the elections and rejected offers from the international community to support the process. Relations have been under additional strain since Mark Lowcock, Under-Secretary-General for Humanitarian Affairs, made a statement linking the humanitarian and political crises in the DRC. As a result, Kabila boycotted his own donor conference in Geneva in April 2018. These tensions have had a ripple effect in the humanitarian space. For example, Congolese Foreign Minister Léonard She Okitundu announced that humanitarian agencies funded by the Belgian Government, with whom Kabila’s relations are particularly tense, would not be allowed to work in the DRC. Generally speaking, it has also become more difficult for international staff in other NGOs to acquire visas. Another significant development is the pledge by Kabila’s government to create a Humanitarian Fund Management Agency to ‘manage, monitor and control humanitarian funds and work to channel all financial flows affecting the humanitarian sector’. This appears to be an attempt to confront perceived international interference but is likely to result in a shrinking humanitarian space in the DRC. While regional and international actors attempt to secure the elections at the end of 2018, tensions related to the political climate will need to be carefully monitored. The 2011 elections were marred by outbreaks of violence in the capital and south-eastern provinces when the ruling elite appeared reluctant to transfer power to the opposition. As a result, the Congolese government became warier of civil society actors who might denounce electoral misconduct. The complex political landscape in which the 2018 elections are set to take place suggests that there may be a similar eruption of violence, presenting an increased threat to NGOs. Violent confrontations between the government’s militias and rebel groups are likely to intensify in the Kivu and Kasai provinces if Kabila retains power. This will directly expose aid workers who are attempting to curb the current crisis, threatening both their security and their ability to access remote populations.